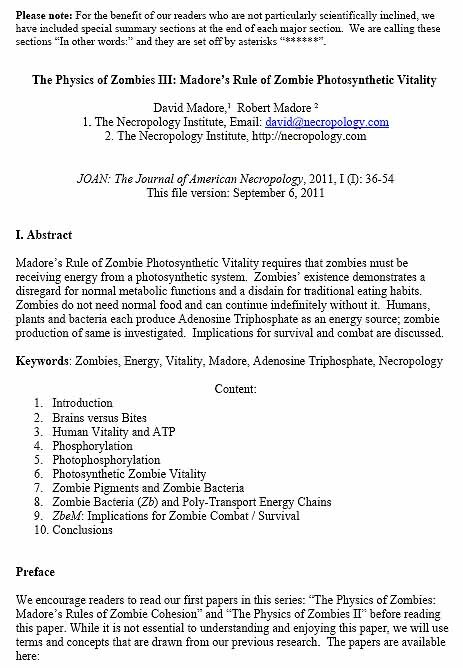 The Physics of Zombies III: Madore’s Rules of Zombie Photosynthetic Vitality – Scholarly Article Review | We Zombie! The Madore brothers are still at it, bringing us their third paper in the Physics of Zombies series: The Physics of Zombies III: Madore’s Rules of Zombie Photosynthetic Vitality. The zombie community is going to owe these guys – these are the only papers I’ve seen that seriously tries to explain the science of zombies and how it’s possible for them to do the impossible things that they do. The paper is available for download. In this paper, the authors speculate on how zombies receive energy to keep going – they don’t eat or have normal metabolic functions. The human model of ATP (Adenosine Triphosphate) usage by living cells as fuel is extrapolated to how that might work in zombies, and they found that the only way this might work is if ATP production in zombies occurs due to a process involving photons, or light, which reacts chemically to produce energy. It’s a brilliant hypothesis and one that makes sense – lots of documented records of excursions by zombie hunters exist which involve finding zombies trapped in a cellar or other dark area where the zombies have been standing for months or even years. 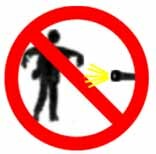 As soon as the hunters shine their flashlight or torch light on the zombies, they spring to life, suddenly reanimating as if they were active all along. 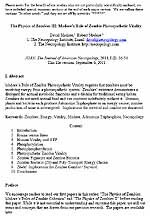 The paper begins with an introduction to human vitality and ATP, delving into phosphorylation and the energy cycle of ATP turning into ADP (Adenosine Diphosphate) and then back into ATP. You’ll learn about phosphate tails, about the mitochondrial membranes at the center of eukaryotic cells and the movement of hydrogen ions between the membranes, and how an osmotic gradient or charge difference controls the adding and removing of those phosphate tails. Whew! Luckily, the authors have provided special summary sections at the end of these discussions restating the discussion in laymen terms. Next we look at the similar process in plants, called photophosphorylation, which in a sense is the process where plants “eat” sunlight in order to power the same ADP->ATP->ADP cycle. A pigment in the plant, Chlorophyll A, absorbs the light, causing the molecules of Chlorophyll A to get excited, releasing an electron, producing hydrogen ions which work inside a structure called a chloroplast (plants don’t have mitochondira) containing thylakoids which are membrane bags for the hydrogen ions to pass through, releasing energy for phosphate tail capturing, which is later detached, releasing energy to the plant cells. Whew again! Luckily, we have another summary section now to put that in English. Finally, with the background out of the way, we can get back to the hypothesis of the paper – that zombies must be receiving their vitality by using light as an energy source. There must be zombie pigments that react to light and the authors suggest that this pigment is rhodopsin, found in the human body, but in fact must be way more prevalent in the zombie body. This happens due to bacteria that merges with mitochondria, providing energy for ATP production for the bacteria itself as well as the host cells, in other words, a symbiotic relationship between the bacteria and the zombie cells. There is going to be some debate on how this bacteria enters the zombie system. Since bacteria are much much larger than viruses, perhaps the viruses are grouping together, forming viral inclusion bodies which can be thought of as holding tanks large enough to hold a bacteria inside like a prisoner. Either this, or the virus enters the zombie first and attacks the zombiotic system, weakening it, allowing the bacteria to proliferate. This delivery method could probably be a series of papers on its own. What follows next is a discussion of zombie bacteria and energy transport chains – both direct photonic electron excitation and indirect photonic electron excitation. This could explain how the energy can reach down inside the zombie even though light cannot pass through the outer layer of the zombie. This section is highly technical but again we’re provided with summary statements throughout. The final section of the paper draws conclusions about the implications of this information for zombie combat and/or survival. Interesting facts are presented such as the “best” time of day to attack zombies, i.e., just before dawn when their ATP levels are at their lowest and the zombies would therefore be the most sluggish. All in all, this is another excellent scientific article from the Madore brothers, bringing us a little closer to an entire set of facts and scientific knowledge in order to stop or slow the coming zombie apocalypse. Thank you both for the kind words. We have fun, pleased as punch that others are enjoying it too. Awesome! Nice summary of the paper. Let’s hope the Madore brothers keep going with their scientific research. Perhaps they can find a way to stop this menace once and for all. Maybe instead of a bullet to the head, we could spray paint a zombie with black paint and wait for it to “die”.